It is rarely appropriate to indicate colour, by use of tactile means, in tactile and high contrast illustrations. Such detail tends to obscure the form and shape of the work. Where bright colour fill cannot be perceived by a user, they should at least benefit from a clear and uncluttered tactile representation of the subject. However there are always instances where colour is central to a subject and therefore requires some sort of representation, for all users. An example of this would be the colour zoning in a building which would need to be indicated as tactile colours in any tactile and high contrast floor plan. Indeed where there is no such zoning but different elements of a floor plan are indicated by both colour and tactile fill, I think it would be a good idea for the two to always correlate. For this reason I am putting this scheme of tactile colours out, into the public domain, in the hope that it becomes a kind of de-facto standard. Rather than re-inventing the wheel, I have used traditional heraldic conventions as a starting point for this scheme of tactile colours. Where coats of arms had to be illustrated in black and white, hatching was used to indicate colour. I have adapted, simplified and modified this hatching; for use as tactile representations of colour for the blind and visually impaired. 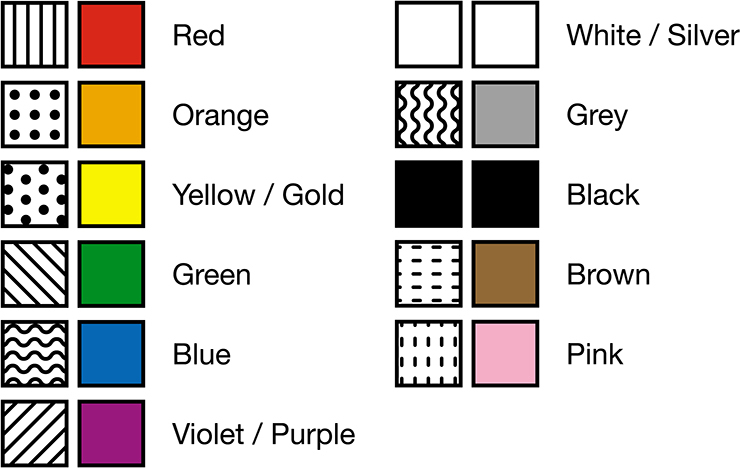 Orange, brown and pink were not actually regarded as colours in heraldry, so I have invented these. I have tried to indicate Orange's relationship to both red and yellow, as I have also brown's to orange and pink's to red. Blue is traditionally depicted by straight horizontal lines, however Braille readers are slightly less able to discern horizontal lines than others. I have changed this convention so that blue is represented by wavy horizontal lines, redolent of water. One unavoidable variation is whether the background or substrate is white (such as UV printing) or whether the background is black and the raised elements are white or machined white metal (such as cast metal panels and signage). Where the background is white; black is represented by a continually smooth or (if necessary) dimpled, raised area: Where the background is black; white is represented by a continually smooth raised area.